Learn about the games, games, and more games you get when you move to a Windows PC. This time, the focus is on a topic where Microsoft has traditionally trounced Apple: gaming. There’s no denying that over the past few years, thanks to the App Store and services like Steam, gaming on a Mac is better than it's ever been. But with a library of titles that spans decades and a large, dedicated community of developers and players, Windows computers are undisputed for gaming. There’s so much to say about Windows gaming that all I can do is point you in the right directions—tell you what Windows 10 has to offer, and name the most awesome sources for downloading games. Let’s get started! 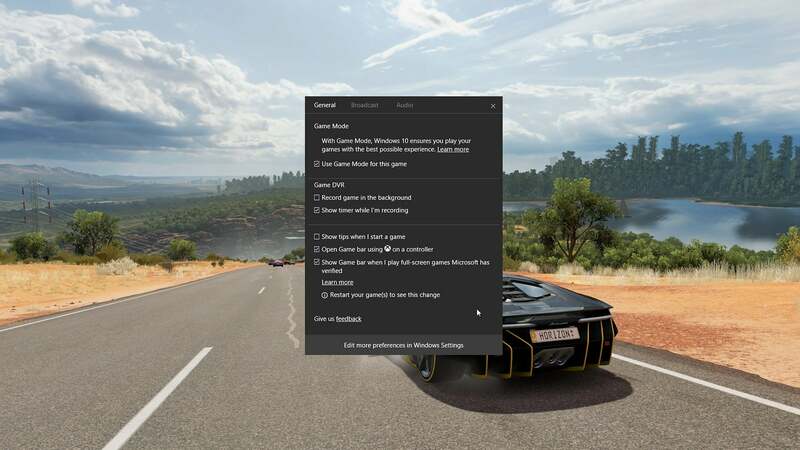 Windows 10's Game Mode helps older or slower PCs perform faster by prioritizing the game over other running applications. Windows 10's Creators Update introduced a feature called Game Mode. It’s a setting designed to improve the gaming experience for people with older or slower PCs. Game Mode does this by prioritizing the game you’re playing, giving it the maximum amount of your computer’s processing power. As for any other resource-hungry applications running in the background, they can wait. As our tests of Game Mode show, however, this feature isn't for everyone. High-end Windows laptop, like Microsoft's Surface Book (which I’ve been using) or an Asus ROG Strix simply don't need its help—turning on Game Mode would have no visible effect. However, on mid-level rigs like the Dell Inspiron 7000, and low-end gear with integrated graphics, the difference the feature’ll make to your gaming could be dramatic, providing better frame rates and less stuttering as you play. Given that it comes free with the Creators Update, it's a nice bonus. The Windows Store can be frustrating to navigate, but your persistence will be rewarded by the discovery of some great games. 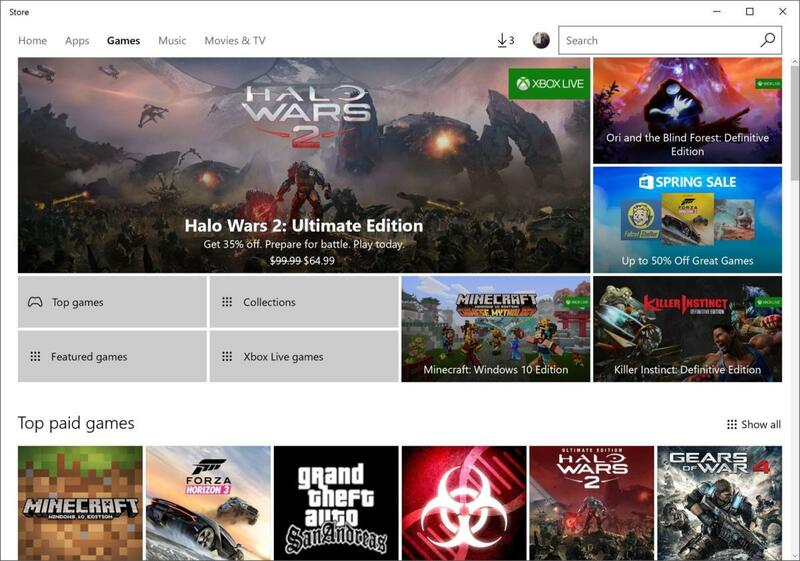 The Windows Store will likely be the first exposure to Windows gaming for most newcomers. Let me be blunt here: Compared to the other resources I talk about as part of this story, the Windows Store is a hot mess. After fighting your way through all of the movies, music, and productivity software the store has to offer, you’ll find that the Store will make you work to download a game. Some of the games available through the service are designed to work both with your Windows PC and with Windows Phone. Others aren’t. Many of the games are touch-enabled, while others require a gamepad to play or can only be interacted with via keyboard. Most frustrating is the fact that AAA titles, like Tomb Raider or Gears of War 4 are mixed in with the motley crew of freemium games more commonly associated with iOS or Android devices. As disappointing as all of this can be, the Windows Store does have two things going for it. First, there’s no need to create a new account in order to use it—access to the store and shopping is all made possible through the same Microsoft account you use to sign into Windows. Second, and this is cool, a growing number of games in the store support Xbox Play Anywhere's cross-platform play. This means Windows gamers can engage in multiplayer battles and co-operative games with their friends who own an Xbox One. Steam is a great starting point for anyone interested in adding some new purchases to their gaming collection. Given that it’s available to download in 237 countries and in 21 different languages, it’s safe to call Steam a global gaming phenomenon. At last count, the service boasted close to 2,000 different downloadable games. Big bonus: Thanks to a large, enthusiastic community of amateur and professional developers, a huge number of free downloadable mods can be added to many of your favorite gaming titles. 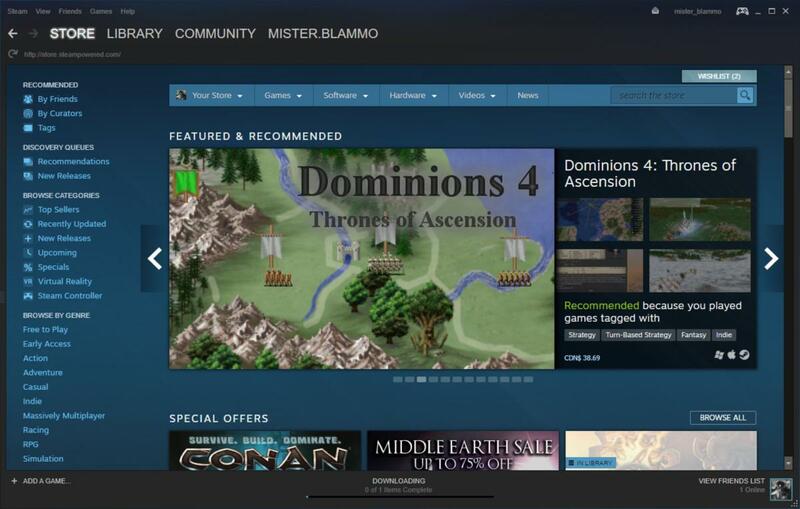 Steam routinely sells games for a small discount and hosts massive seasonal sales events. This makes it easy to build a sizeable game collection without breaking the bank. To get started, download the service’s client, create a Steam Account, and you’re in business. While games are the main attraction, Steam’s not just a marketplace—it’s a 35-million-member social network, too. Using your Steam Account, you’ll be able to compete in multiplayer matches with other players, and talk smack and chat with your friends even while you’re hip-deep in a game. Premium AAA titles like Gears of War 4 are here, too. If you believe that there’s no school like the old school, GOG.com is your best bet for some great games. Geeks of a certain age will remember that, back in the 1990s, the best games were story-rich, shooters weren’t as twitchy (or as pretty) as they are today, and simulators demanded and rewarded skill and strategy. If you’re nodding in recognition of any of this, then you’ll want to check out GOG.com. GOG—or Good Old Games, as it was once known—is the best source on the web for DRM-free classic and, increasingly, recent games from legendary developers like LucasArts and Black Isle Studios, independent makers Like Telltale Games and AAA properties like The Witcher III: The Wild Hunt. Classic titles like Planescape: Torment, Fallout 2 or X-Wing can be had for $20, while more recent AAA games go for $60 and up. 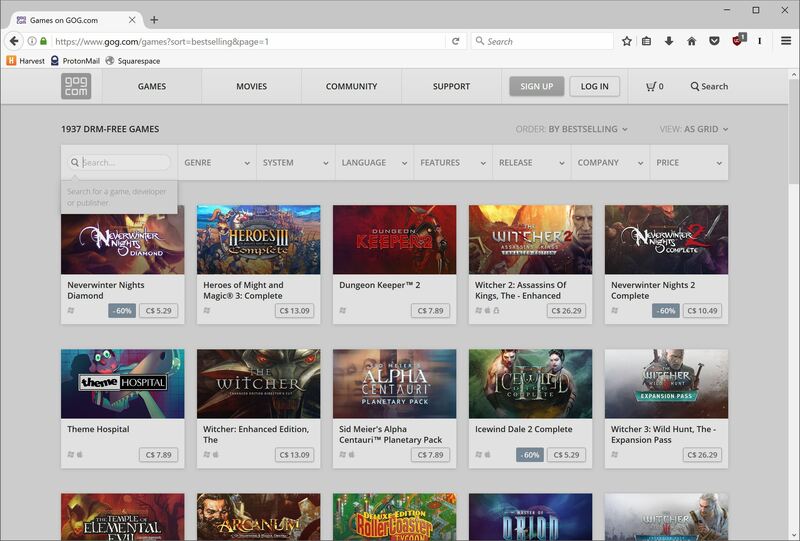 Like Steam, GOG demands that you create an account in order to purchase and download games. Those new to gaming, take note: many of the titles available through GOG, due to their age and the limitations of the hardware available at the time they were developed, come with crude graphics compared to the sort of visuals we’ve come to expect from modern games. If that’s a turn-off for you, GOG might not be the best service to fulfill your gaming needs. That said, some of the most-loved titles in PC gaming history can be found here. Give these digital senior citizens a chance and I guarantee you’ll be pleased to lose countless hours of your life to them. Origin is your online destination for some of the most successful gaming fan chases in history. Electronic Arts makes some of the most popular games around today, but they don’t play well with others. As such, the bulk of their library can be accessed only by buying a physical copy of their games or hitting up EA Origin: Electronic Arts’ online marketplace. 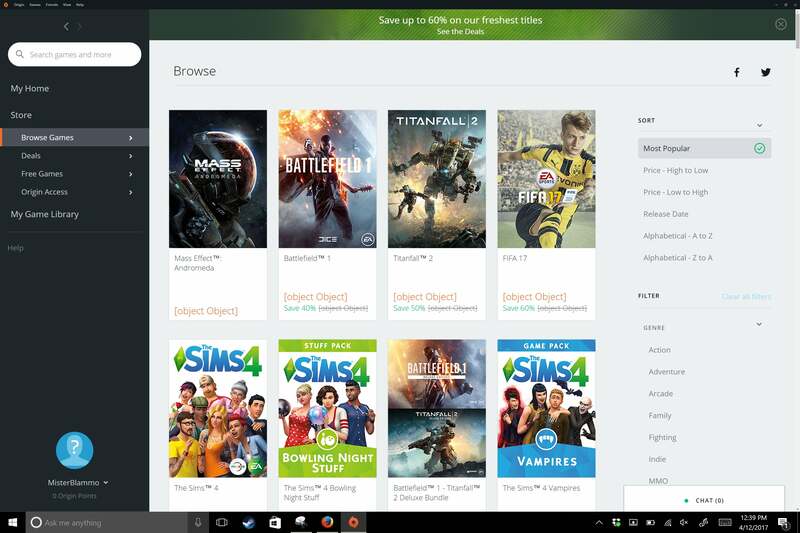 If you’re into The Sims, the Battlefield franchise, Titanfall 2, Star Wars Battlefront, FIFA, the Dragon’s Age series or Mass Effect, you’ll want to download the Origin client. As with the other services I’ve talked about here, Origin requires that you open an account in order to make any online purchases. While Origin doesn’t offer as many sales as Steam does, you’ll occasionally find steep discounts on some of the most popular games of the past few years. As it offers titles you simply cannot find anywhere else online, sooner or later you’ll likely end up downloading Origin. 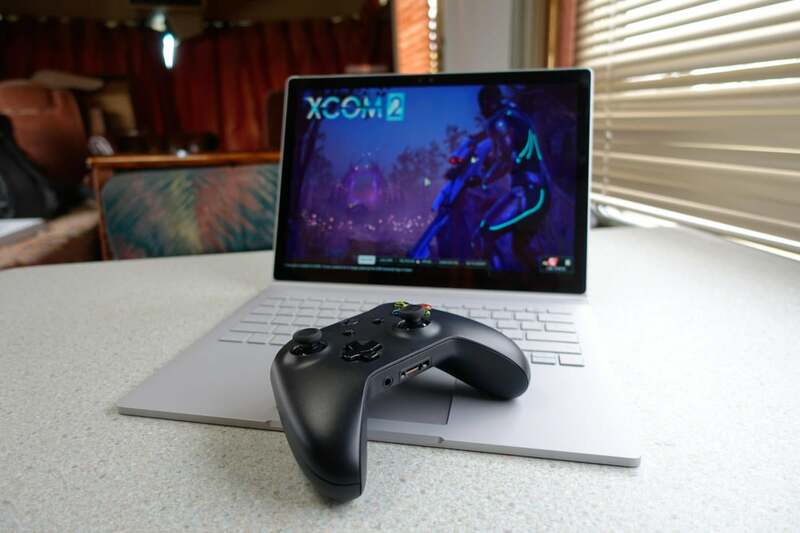 Now that we've covered the hardware, the software, the PC-iPad-iPhone intermix, and the glories of PC gaming, it's time to decide: Stick with Windows, or go running back to the familiar old Mac? We’ll talk about what I’ve learned over the past few months as a Windows 10 user, and whether switching to a PC will work for me or other Mac users. Stay tuned!